The Keyblade of heart, sometimes referred to as Riku's Keyblade, or Dark Riku's Keyblade, is a Keyblade created by Ansem, Seeker of Darkness from the hearts of the Princesses of Heart, with the exception of Kairi. In addition to being a combat weapon like Sora's Keyblade, this Keyblade has the ability to unlock a person's heart, releasing the darkness within. Its name, if it has one, is currently unknown — it has only been referred to by its type. Riku summons the Keyblade of heart while possessed by Ansem. After Sora retrieves his Keyblade from Riku and manages to defeat him, Riku stumbles around Hollow Bastion, and eventually runs into Ansem, Seeker of Darkness, who convinces Riku to give Ansem his body. At the same time, Maleficent has used the seven captured Princesses to open the Final Keyhole, but without Kairi's heart, it is incomplete. With Ansem in control, Riku summons the Keyblade of heart, created from the six available hearts of the Princesses. Without Kairi's heart, the blade is also incomplete, and could release the stolen hearts if actually used. The friends then track Riku down to the Great Hall, where Riku has used the incomplete Keyblade to summon the Keyhole of Hollow Bastion. He reveals that Kairi's lost heart has been within Sora all along, and that it must be released in order to complete the Keyhole. He moves to release Kairi's heart by using the Keyblade on Sora, but Sora parries at the last second, and eventually defeats the possessed Riku. Despite this, Kairi is still catatonic, and Sora is unable to seal the incomplete Keyhole. In order to save Kairi, Sora turns Riku's Keyblade on himself. This releases his and Kairi's hearts from Sora's body, reviving Kairi, but also completes the Keyhole and casts Sora into the darkness. Unbeknown to anyone, this act also produces Sora and Kairi's unique Nobodies, Roxas and Naminé. Secret Ansem Report 10 The Keyblade itself dissolves, releasing the Princesses' stolen hearts. Sora fades into a Shadow just as Kairi awakens, and the Heartless rapidly emerging from the Keyhole force Kairi, Donald, and Goofy to flee. The Keyblade of heart appears in Roxas's dreams as one of Sora's memories. 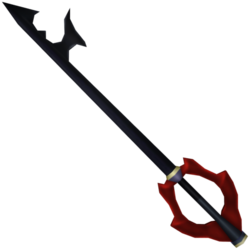 The Keyblade of heart has a simple design of red and black, akin to the Kingdom Key, with its teeth forming the outline of a heart. It has a rather dark design, despite being created from hearts of pure light. As it lacks Kairi's heart, this Keyblade is incomplete, and has never been seen at full power. It also lacks a Keychain. ↑ Director's Secret Report XIII, p. 28; Tetsuya Nomura: "Keyblades may have one of two make-up; light-side, or dark-side. That is not a 'good or evil' classification, however. Like interior versus exterior keys, the only difference is merely from which side they are able to work. The door of each world is normally closed, the keyhole itself in an invisible state. These Keyholes, which appear when a Keyblade is held up to them, are not locked. This means that once the Heartless find a door it is very easy for them to open it and steal the heart, which is why Sora went around locking those doors in the first title. Keyblades were also used for a purpose different to any prior intentions or reasons - on the door that opens on the heart that stands as the gathering of the world's hearts, Kingdom Hearts - to guard against the darkness leaking from within that heart. In order to do that, the door had to be shut from both the side of light and the side of darkness, which required the use of Keyblades from both the Realm of Light and the Realm of Darkness. That is why King Mickey went to get a Keyblade from the Realm of Darkness - to serve as the counterpart to Sora's Keyblade of the Realm of Light." Translation via Goldpanner. ↑ Kingdom Hearts, Riku: "What should I do?" / Hooded man: "It's really quite simple. Open yourself to the darkness. That is all. Let your heart, your being, become darkness itself." ↑ Kingdom Hearts, Riku: "The Keyhole cannot be completed so as long as the last princess of heart still sleeps." ↑ Kingdom Hearts, Riku: "Yes. A Keyblade. But unlike yours, this Keyblade holds the power to unlock people's hearts. Allow me to demonstrate...Behold! Now, open your heart, surrender it to the darkness! Become darkness itself!" ↑ Director's Secret Report XIII, p. 28; Tetsuya Nomura: "Then, as for the Keyblade made from the hearts of the princesses that Riku wielded in the first title, it was designed from the special hearts of the princesses purely for the sake of the plan to make the keyhole appear in Hollow Bastion and force darkness to flood from that heart. It was different from the original Keyblades. There are also hints that Keyblades are artificial, people-made objects." Translation via Goldpanner. ↑ Kingdom Hearts, Riku: "It's no use. That girl has lost her heart. She cannot wake up...The Keyhole cannot be completed so as long as the last princess of heart still sleeps...Yes, and without her power, the Keyhole will remain incomplete. It is time she awakened...But first, you must give the princess back her heart...Don't you see yet? The princess's heart is responding. It has been there all along. Kairi's heart rests within you!...So, I shall release you now, Princess. Complete the Keyhole with your power. Open the door, lead me into everlasting darkness!" ↑ Kingdom Hearts, Leon: "That's right. You have one more friend to worry about. Riku's Keyblade must have been born of the captive princesses' hearts—just like that Keyhole you saw. Of course, without Kairi's heart, it remained incomplete. Once that Keyblade was destroyed, the princesses' hearts should have been freed. Don't worry, Sora. If anyone can save your friend, you can." This page was last edited on 5 April 2019, at 17:14.